MENU_ITEMS="` cat "$GET_MENU" | tr '\n' '|' | sed '$s/.$//' `"
It worked when I tried it in Precise. wasn't necessary each time the menu file was changed. Im not quite sure i understand what you mean in the second lines of your post, could you give an example? So the user filled in fields rather than create a file. and maybe a button to click so previous tray icons quit. POPUP_TEXT="one of my special mini menus "
MENU_ITEMS="` echo "$GET_MENU" | tr '\n' '|' | sed '$s/.$//' `"
There are also a lot of tips scattered throughout the thread for generating simple yet useful svg images within scripts as well as some examples for parsing data in a way that is useful for tray apps. This Yad sytem tray right click menu is great and very useful. 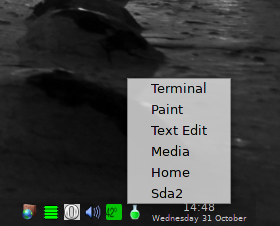 I would like to know if it is possible to get small icons at the head of the entries of this right click menu? And if yes, how? - the bottom of the menu is hidden behind the JWM task bar. Sorry, I don't understand what you mean! Is it to say that such a menu exists, but simplier, without the "echoing to the pipe on >3". If yes where could I find it? rather than an answer to your question Argolance.